This was a week of ticking To Dos off the "List That Must Be Done", beginning with the tax return, mailed very timely on the 17th along with hefty checks to both federal and state for the first time in my life. Funny, I thought that W-2 that showed $2K less than 2011's W-2 which was $2K less from 2010's W-2 thanks to years of furloughs and no raise would not lead to such a thing but it did. Then I retrieved A Bountiful Life quilt from Little Quilts (thank you, Mary Ellen, for displaying it, it looked so beautiful there!) and got it boxed and mailed to Kansas City where it will be posing and primping at Spring Market. Here it is as a top; forgot to take a finished picture! We like to call this Chemo Brain. This quilt is of course based on the red and white one from the Armory Show. quilted by Dena Rosenberg (a great job, Dena, can't wait for you to do the others I've given you and I have two more to add to the stack) and got the binding put on by hand, surely my least favorite job in all of Quilty Land, and made choices for the other four to send. I wanted to send twenty but five it had to be. Got those described, packed up, and left at FedEx today, and now the desk, or should we say cutting table, is cleared and ready to continue newer and enticing projects. Quilty stuff for the rest of the day consisted of picking backings and getting them ready for the two quilts I want to leave with Dena to quilt. 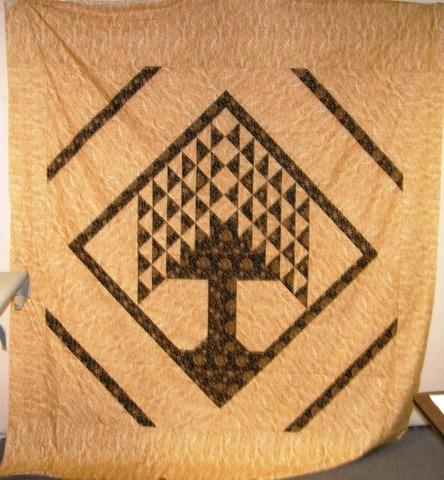 Nice Tree of Life quilt. Much better than the smaller size one I made quite some time ago. I look forward to the day you are feeling much better and get back to the jigsaw puzzles. Love that Tree of Life quilt! So funny that you hate the binding. I love that part! Probably because it requires no thinking on my part, just stitching along while the TV is on! Take care of that chemo brain of yours, i want to see what else shakes out of it. Feel better my friend.